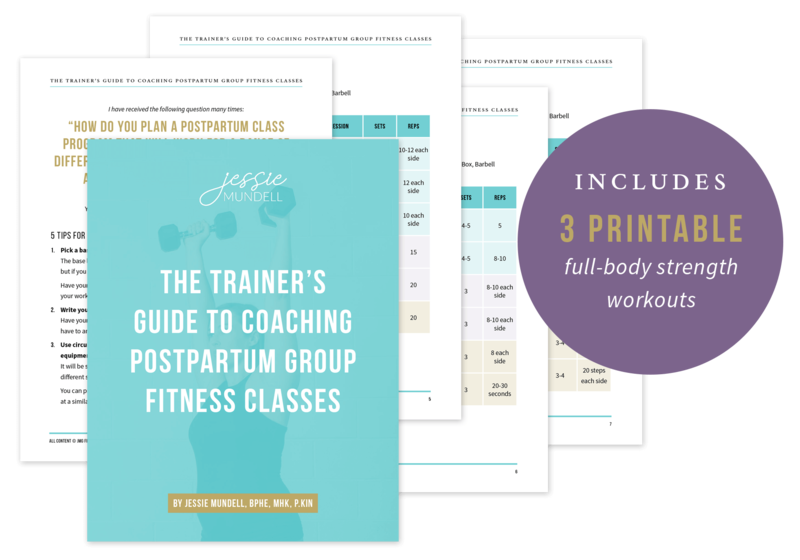 How do you plan a postpartum fitness class program that will work for a range of different bodies, fitness levels, and core and pelvic floor health needs? 3 printable, done-for-you, full body strength training based workouts that give you progression and regression options for exercises in each session. You will be ready to immediately implement these workouts into a group class program. These workouts will be appropriate for group fitness classes that are scheduled for between 45-60 minutes in length, where you are running a warmup, strength and conditioning section, and cooldown. Of course, you can modify the sets and reps in each workout to make them appropriate for shorter classes. The base level exercises in these workouts use resistance bands, mini bands, dumbbells, chin-up bar, and benches, with the option to use kettlebells, boxes, suspension trainer, and barbells. Yes, send me the free guide!